Modern and elegantly furnished, the 4-star Hotel Carlton in Treviso provides accommodations complete with every comfort on the city ramparts near the Altinia Gate. 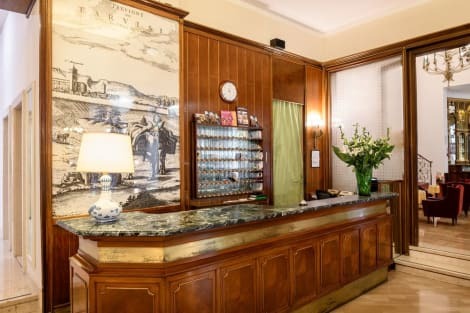 Well-service by public transportation and not far from the train station, the Hotel Carlton is popular with business travelers and those staying in Treviso on vacation or to see one of the numerous sports events. Our hotel includes modular meeting rooms, Wi-fi internet, a reading room, parting lots and a special discount with the nearby spa. When you stay at Hotel Continental in Treviso, you'll be in the historical district, within a 10-minute walk of Loggia dei Cavalieri and Palazzo dei Trecento. This 4-star hotel is 19.3 mi (31.1 km) from Forte Bazzera and 0.4 mi (0.6 km) from Church of San Nicolo. Grab a bite to eat at the Il Bolognese, a restaurant where you can take in the garden view and dine alfresco. Or stay in and take advantage of the room service (during limited hours). Wrap up your day with a drink at the bar/lounge. A complimentary buffet breakfast is served daily from 7 AM to 10 AM.